Whether you're looking to lose five pounds or 50, you need to burn more calories than you eat each day to burn fat. A deficit of 500 calories daily means you'll lose roughly one pound of fat weekly. The nutrient content and low calorie count of oranges supports weight loss, and their natural sugar offers a guilt-free way for you to satisfy your sweet tooth. However, you'll still need to follow a balanced, calorie-controlled diet and exercise regularly to lose weight. In other words, don't count on oranges as a miracle cure for fat loss. Despite their sweet taste, oranges are relatively low in calories, which helps you create a calorie deficit. 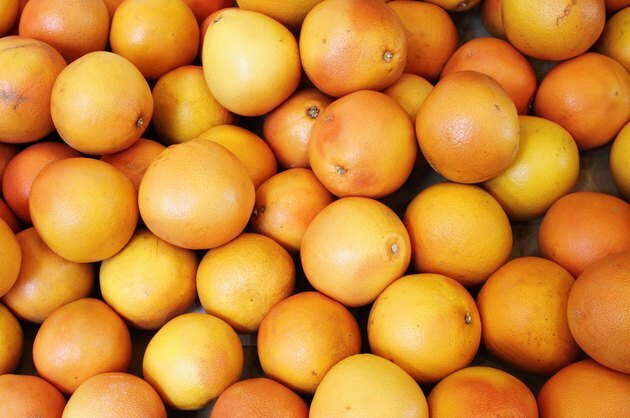 An entire Valencia orange contains just 59 calories, while an entire navel orange offers 69 calories. A cup of Valencia sections contains 88 calories, and an equivalent serving of navel sections contains 81. Most of these calories come from the fruit's natural sugar -- a source of energy for your muscles and brain -- while a small amount comes from the fruit's protein content. Oranges help with weight control because of their dietary fiber content. Fiber helps control your appetite. It swells with water and keeps food in your stomach for longer after a meal, so you'll feel full for longer after eating. The role of fiber in weight loss requires more study, explains the Linus Pauling Institute, but people who follow high-fiber diets tend to be leaner, are less likely to gain weight and tend to eat fewer calories than those who follow low-fiber diets. A Valencia orange offers 3 grams of fiber, 12 percent of the daily needs for women and 8 percent for men. Navels provide slightly more, at 3.6 grams of fiber per orange. If you're looking to lose weight, make sure you snack on whole or cut up oranges instead of drinking orange juice. OJ is high in calories compared with oranges; each cup contains 112 calories, almost twice as many calories as a whole orange. Simply switching from a cup of orange juice to an orange each day can save you up to 19,345 calories annually -- the equivalent of 5.5 pounds of fat. OJ is also less likely to keep you feeling satisfied than a whole orange, because it lacks dietary fiber. If you're bored with plain oranges, get creative and use oranges in diet-friendly recipes. Top a spinach salad with orange sections, or combine sliced oranges with sliced fennel and toss them in an olive oil vinaigrette for a sweet and satisfying salad. Make healthful "creamsicle" smoothies by blending seedless orange slices, non-fat milk, non-fat Greek yogurt and ground flaxseed. For a nutritional boost, add a scoop of vanilla-flavored protein powder. Go Ask Alice! : Is Juice as Good as Whole Fruit?